※ CM-510 is not produced currently; it is not sold any longer. PC Link (Serial Cable) : Used to connect the serial cable to the CM-510 and PC via serial port. Used for communication with other PC or downloading task code. Battery Jack : Used to connect with the battery. Power Switch : Used to turn the robot ON / OFF. MODE Button : Used to change the operation mode of CM-510. Please read below for more information. START Button : Used to START selected mode. Please read below for more information. U / L / D / R Button : Used for input purposes when a program is playing. 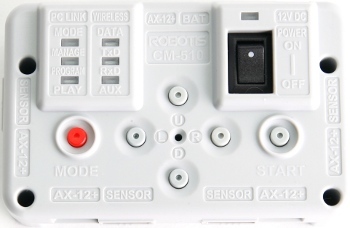 These buttons can be used to send commands to the robot. AX/MX Serise Bus Port : Used to connect the AX/MX Dynamixel in a daisy chain method. Peripheral Devices Connection Port : Used to connect Distance Measurement Sensor, Touch Sensor, IR Sensor, and peripheral devices. The port numbers for each port are represented in bars such as I , II , III, IIII , IIIII , and IIIIII. Mode Display LED : LED to display current operation mode of CM-510; Detailed descriptions are provided as below. It displays Dynamixel management mode is in progress. It is used to set or test the operations of CM-510 and AX/MX Dynamixel using RoboPlus Manager. 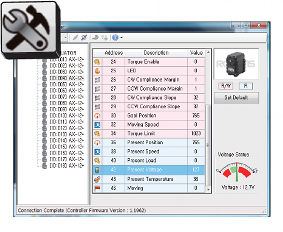 It is automatically executed when RoboPlus Manager and CM-510 are connected. It displays the motion edit mode is in progress. It is used when the motions are editted with RoboPlus Motion. 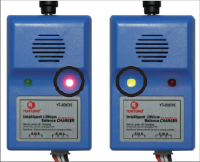 It is automatically executed when RoboPlus Motion and CM-510 are connected. It displays the task code mode is in progress. It is used after downloading the written code to CM-510 with RoboPlus Task. The Start button must be pressed directly by the user to execute When PLAY LED flickers. Status Display LED : The LED represents the current status of CM-510. Detailed discriptions are provided as below. TxD : Turned on while CM-510 is transmitting the data to the outside. RxD : Turned on while CM-510 is receiving the data from the outside. AUX : Assigned LED to be used by the user in the program. It can be turned on or off using task code. 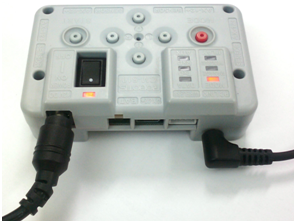 The power is applied if the battery is connected to battery socket of CM-510 or if the power switch is set to ON after connecting SMPS to power jack socket. If the power is impressed, Power LED is turned on and one of the Mode Display LEDs flickers. [Turning the power on] : The power is turned on by moving the switch from OFF to ON. ※ If the power is not turned on in spite of moving the switch to ON, the batteries may have been discharged. Pleaser refer to Charging to recharge, or connect the power using SMPS. [ Start ] : Move to PLAY using Mode Button to operate robots. Press START Button to execute when the LED on PLAY flickers. ※ If START button is pressed, the LED on PLAY is not supposed to be flickering any more; that is the normal status of the execution. [ End ] : If you want to stop the executed operations, press MODE Button to get back to waiting mode stauts, or turn OFF the power using Power Switch. It is used to control Dynamixel and the peripherals, and it can connect Dynamixel(AX/MX Dynamixel... etc.) and various parts of OLLO(Touch Sensor, LED Module, IR Sensor etc.). 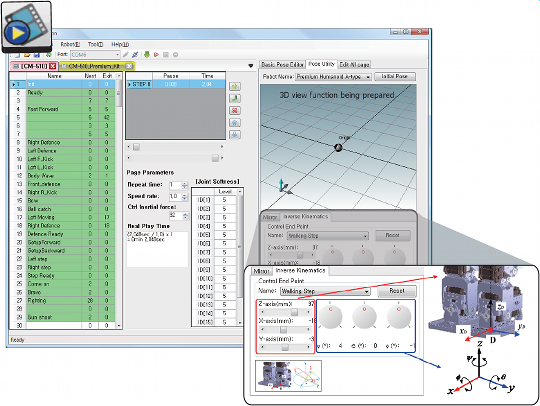 Specific motions can be edited and saved through RoboPlus Motion. 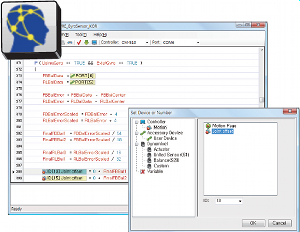 The saved motion (mtn file) can be always executed by RoboPlus Task, and also the motions of each part can be controlled by writing the task codes for control. 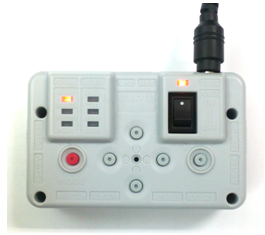 The controller of CM-510 can be controlled in C language. Please refer to Embedded C for more information. 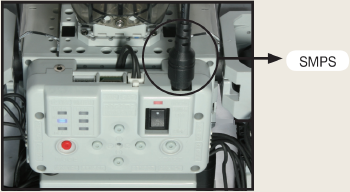 PC Link(Serial Cable) of CM-510 and Serial Port of PC must be connected using download cable to communication with PC. If you want to communicate with PC on the laptop without serial port, you can communicate with PC using USB2Dynamixel. 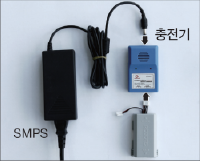 ZIG-110 wireless communication module can be connected to CM-510. If the alarm rings during the robot operation, the battery must be charged. If the charging is started, the red LED on the charger starts flickering. If the charging is completed, the green light is turned on. ⇒ The robot may be operated using external power if SMPS is directly connected to robots. 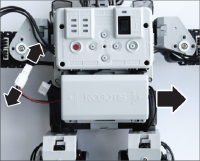 ⇒ Two connectors are connected to the battery: the connector for charging and the connector for operating robots. 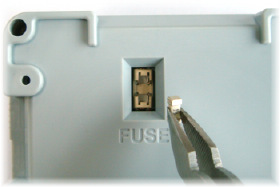 The fuse in the CM-510/CM-530 prevents it from overloading,which can damage the circuit. If the CM-510/CM-530 does not turn on with the battery but turns on when connected to the SMPS, replace your fuse. ※ The size of the fuse is shown below. Use a 125V/5A~10A fuse. 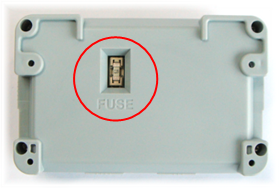 ① Find the fuse on the back of the CM-510/CM-530. 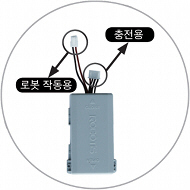 ② Use a pincette to replace the fuse with a new one. The pin composition of CM-510 Power is as below. 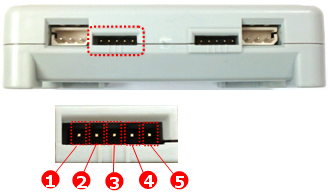 The pin composition of CM-510 external port is as below. ADC : The analog signals from the sensor made by the user can be read. The functions on the pins of communication device connection port are as below. 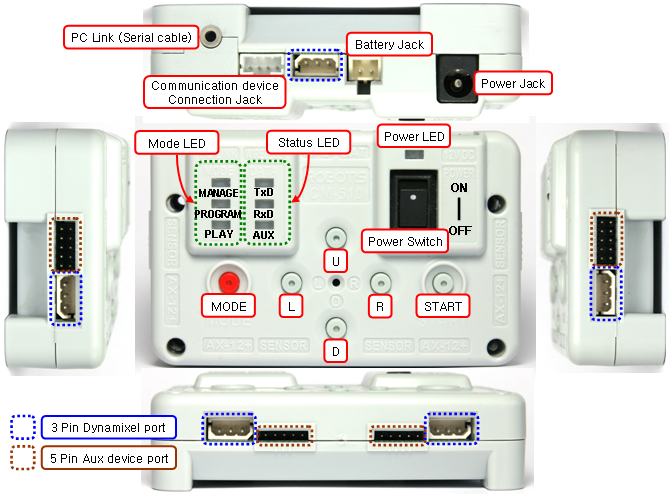 The functions of pins on the 3-pin connector port are as follows. Please refer to AX-Series Pin Assignment for more information. Please be careful not to change the direction considering the angular part.